The very first page of Pandemonium hooked me, and I didn’t put it down again until I had finished reading. In this book Lauren Oliver’s writing is tight, to the point, and strangely compelling. It’s really hard to tell yourself you will stop reading after this chapter, this page, and before you know it you’re reading the last page with bated breath. 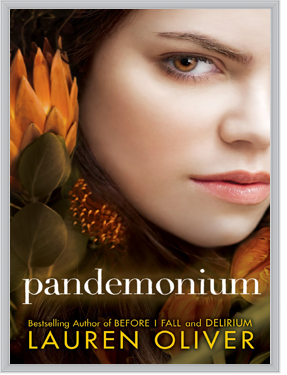 Reading Pandemonium is an emotional ride: it’s full of the anger, determination, ferocity and grief that Lena feels, so different from the naivety and romance of Delirium. Lena surprised me in this book. In Delirium she behaved erratically, placed too much trust in Alex from the offset and was constantly worrying about her deteriorating relationship with Hana. In Pandemonium Lena is grieving. For the life, the friends, and the boy she left behind. The book is written in a THEN and NOW format, with the chapters alternating between THEN (right after Delirium ended) and NOW (about six months down the track). The format brings out Lena’s character: we can see how strong she is now and see her journey to become that way as well. I loved this book (even with that cliffhanger that will ensure that I pine for Requiem for ages before I get my hands on it), and recommend the Delirium trilogy for everyone who likes a dystopian young adult novel.